Borrowing structure from science, Griffin Gonzales presents a revolutionary portrait of the Presidency. As our first President, George Washington was like hydrogen. Harrison's month-long Presidency was ended by a fatal virus. Ike was a well-known "Rebounder." 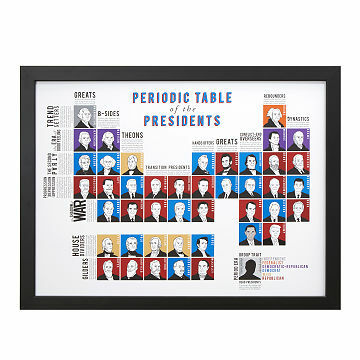 American politics may not be an exact science, but Griffin Gonzales' innovative diagram draws on the iconic Periodic Table of Elements to present the history of the Presidency. Fascinated by Presidents since his third-grade obsession with Millard Filmore, Griffin now combines his study of government with self-taught design skills. Traditional line-ups of our 45 commanders-in-chief can be as dry as a chalk board, but Griffin's version offers a wealth of interpretation: political parties, historical eras, leadership traits, and terms in office. The Presidents are still shown sequentially, but by borrowing the scientific structure of the Periodic Table, they're also organized into columns that teach historical and political lessons. There are even subtle "Easter egg" details, like the fact that Presidents who died in office are facing left (RIP, Abe). The poster makes a proudly patriotic display for teachers, young scholars, and political junkies. Designed in Cambridge, Massachusetts, where both John Adams and John Quincy Adams attended Harvard University. Printed in Portland, Oregon. Griffin Gonzales got in some hot water in third grade. He was supposed to be doing his math problems but instead, he succumbed to temptation: a book about 14th President of the United States, Millard Fillmore. A self-taught designer and bookbinder, Griffin is also a student of Government at Harvard. Undeterred by his third-grade delinquency, his passion for the Presidency continues to this day. I would buy this agin. This s going to be a Christmas gift. Great gift for history teachers! Students have not returned yet but all other teachers are really impressed with it. Just get a premade inexpensive frame and hang. Quite a unique gift for history teachers. Perfect for the history and science enthusiast in your life. The colors are vibrant and clean cut. Some of the categorizations are debatable, but that's history. I bought the framed version, it was really nicely done. I bought one for my daughter who is a history buff and another for my best friend who teaches U.S. History. They LOVE them!! High quality and great information! My professor loved this poster! I got this for my political science professor and she loved it! She has it hanging in her office and has told me she gets compliments from her students and colleagues all the time!